President Barack Obama headed to South Africa on Monday to attend a national memorial service for anti-apartheid icon Nelson Mandela. Obama and his wife, Michelle, boarded Air Force One under cold, rainy skies Monday morning for the long flight. The occasion presented an opportunity for a rare get-together of American presidents. Former President George W. Bush was already on board the plane, along with former first ladies Laura Bush and Hillary Clinton. Former President Bill Clinton was traveling separately from Rio de Janeiro, where he was attending a Clinton Global Initiative event. And former President Jimmy Carter also planned to join the group in Johannesburg. George H.W. Bush is the only living president who will not attend. His spokesman said the 89-year-old no longer is able to travel long distances. The American leaders will join dozens of other dignitaries and tens of thousands of mourners at the memorial service at a Johannesburg stadium. 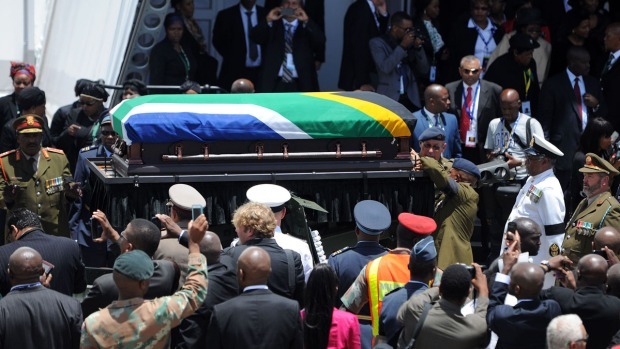 Mandela will be buried Dec. 15, following a state funeral in his hometown of Qunu. White House officials traveling with the president said Obama was expected to speak at the memorial. They also said Obama was hoping to meet with Mandela's widow, Graca Machel, and pay respects to the extended Mandela family. Also traveling with Obama on Air Force One were Attorney General Eric Holder and Susan Rice, Obama's national security adviser. About two hours after Obama's departure, Vice President Joe Biden, who stayed behind, visited the South African embassy in Washington with his wife, Jill, to sign a condolence book in Mandela's memory. "Through his unflagging, unflinching commitment to human dignity and his willingness to forgive, he inspired us and challenged us all to do better,'' Biden wrote. Obama has called Mandela a personal hero, and his own political rise has drawn inevitable comparisons to the former South African leader. Each was his nation's first black president and a winner of the Nobel Peace Prize - though those close to the U.S. leader say he is aware of the vast differences in the politicians' experiences. "President Obama would believe that the challenges he has faced pale in comparison to those faced by President Mandela,'' Valerie Jarrett, Obama's senior adviser, said in an interview this summer before the president made a trip to South Africa. Mandela was hospitalized during Obama's visit, preventing a meeting between the two men. Obama did, however, meet with several members of Mandela's family and made an emotional visit to Robben Island, standing with his wife and two daughters in the tiny cell where the South African leader spent 18 of his 27 years in prison. Obama and Mandela met in person only once, a hastily arranged 2005 meeting in a Washington hotel room when Obama was a U.S. senator. A photo of the meeting hangs in Obama's personal office at the White House, showing a smiling Mandela sitting on a chair, his legs outstretched, as the young senator reaches down to shake his hand. A copy of the photo also hangs in Mandela's office in Johannesburg. Mandela had already shaped Obama's political beliefs well before their first encounter. As a student at Occidental College in Los Angeles, Obama joined protests against the school's investments during South Africa's apartheid era. In 1981, Obama focused his first public political speech on the topic.